Finally, with the release of 0.5.2.1 firmware, I've been able to ship this feature that is designed to help UMSP plugin developers and regular users alike. 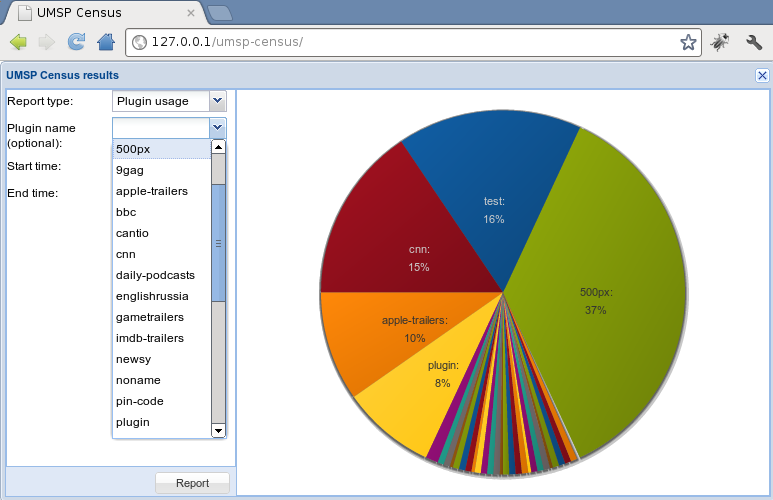 The feature is off by default, but can be enabled via the webend (-> Config Manager -> UMSP -> UMSP_STATISTICS). The way it has been implemented requires each user to enable this feature first (for privacy reasons). The user needs to be able to send statistics data to the server and in return he receives statistics data results in the webend (-> Addon Manager -> UMSP). The counts visible in the webend represents the number of "unique" views in a period of 30 days. A unique view is the action of a user using one plugin in a specific day; if the same user/device enters the same plugin multiple times in 24h, it is counted only once. The number of videos played is not counted. If you, as a plugin developer want to use this feature, you don't need to do anything special in your plugin - it is handled by the UMSP engine. What you need to do right now is to kindly ask your users to upgrade to a supported firmware version (>=0.5.2.1) and enable UMSP_STATISTICS in the configuration. Only by getting enough users contributing, would this feature be useful! Also, developers can use an extra "reporting" interface: http://umsp.wdlxtv.com/stats/dev/. You can log in with your svn credentials and view various reports with historical data. Users who chose not to activate this feature can't see statistics data from the plugins, so, there is some benefit for the end user as well in sharing the data. Having plugin usage data helps the user by showing him which plugins are still active and which are popular. So, if you feel this feature is important to you, let your users know and ask them to enable it so that we can all benefit from the data. Please check: looks like the new plugins not added to base for statistic and deleted not removed from it.